Hashmi Bronkill is one of the most effective for Bronchial asthma. It has been formulated using a combination of 12 natural herbs and ingredients. Its herbal power is known to problems related to shortness of breath, bronchitis and tightness in the chest. It cleans out the respiratory system and keeps it clear. It is all natural with no side effects. 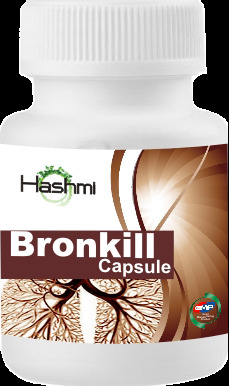 Hashmi Bronkill is the best selling herbal remedy product for asthma. It has been found out to be highly effective of bronchitis and asthma. It helps in maintain normal breathing and strengthens the lungs. This is a Unani supplement which has shown encouraging results in flu and other respiratory problems such as wheezing, coughing and weakness of the body. It has been found out to give best results irrespective of age and severity of condition. Its unique healing properties have enabled it to become one of the best selling natural asthma products in the market. It has been found out to be beneficial in root cause of asthma so that attacks completely. It dries out bronchial phlegm in a manner which enables your lungs to act freely.